The Tufts University Chaplaincy is a dynamic hub supporting religious, spiritual, ethical, and cultural life for all members of the Tufts community. The University Chaplaincy provides pastoral care, supports religious and philosophical communities, educates about spiritual and ethical issues in society and the world, and promotes multi-faith engagement. Each year, the Tufts campus is home to 12-15 religious and philosophical student organizations, including Tufts Mindfulness Buddhist Sangha (which hosts weekly meditations open to the entire community), Tufts Athletes for Christ, and COFFEE (Community OF Faith Exploration and Engagement). Students can join to practice their faith or simply to learn from others. Each week, some 30 spiritual life programs take place on campus, from worship services and holiday meals, to meditation sessions and service activities. Whether coming together to drink tea, listen to a speaker, or discuss a book, these programs offer a space in which the community can gather. Tufts has a dedicated chaplaincy team that supports students' spiritual and interfaith life, and that offers pastoral care and connections to social justice work. Tufts’ associated chaplains include Jewish, Catholic, Muslim, Buddhist, Humanist, and Protestant Chaplains who serve the whole Tufts family as well as their particular communities. Meet Celene Ibrahim, Tufts University's Muslim Chaplain, in the podcast below! The University Chaplaincy also reaches beyond religion narrowly-defined to collaborate and integrate spirituality and ethics into all aspects of the university's endeavors, and to relate with spiritual, ethical, and interfaith communities locally, nationally, and globally. Interfaith programs on campus, including CAFE Pre-Orientation Program and the Interfaith Student Council, allow students to engage with one another's beliefs. CAFE is an award-winning pre-orientation program that brings together incoming first-year students and upperclassmen leaders from diverse religious, non-religious, spiritual, and ethical identities. The common thread? A passion for understanding and creating change in ourselves and our communities. CAFE participants have the opportunity to explore the Boston area on field trips to local religious and cultural gathering places, experience a variety of religious and philosophical practices at Tufts, strengthen leadership skills, and meet with local advocacy and social justice groups. We believe that the time of transition to a college campus can be a time for transformation, too. Learn more in the video below! For more information, and to view upcoming programming, visit the Tufts University Chaplaincy website. The first month of College! Dedicated in 1883, Goddard Chapel welcomes any and all for daily prayer and meditation, and hosts concerts and ceremonies throughout the year. Weekly services include Catholic Mass, Protestant worship, Buddhist meditation, and Hindu puja. 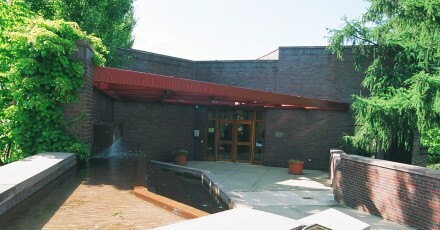 Dedicated September 2007, the Tufts University Interfaith Center is a space for spiritual use by members of the Tufts community. It houses the offices of the Catholic, Protestant, and Muslim Chaplains, as well as the Chaplaincy's Humanist-in-Residence and Buddhist Chaplaincy Intern. Led by Rabbi Jeffery Summit, Hillel supports students to engage with Judaism and Jewish community in their own way. 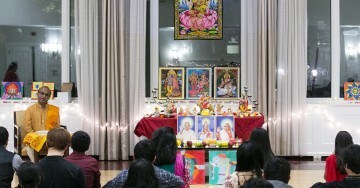 A Diwali prayer and celebration event sponsored by Tufts Hindu Students Council and the Tufts Chaplaincy on October 24, 2014. 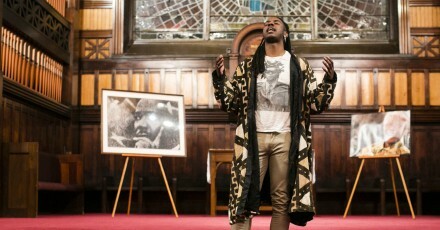 The annual MLK celebration at Tufts University on January 23, 2014. 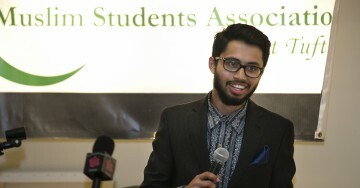 Abdurrahman Abdurrob, President of Tufts' Muslim Student Association, at the Eid holiday celebration by the Muslim Students Association at Tufts on October 17, 2014. 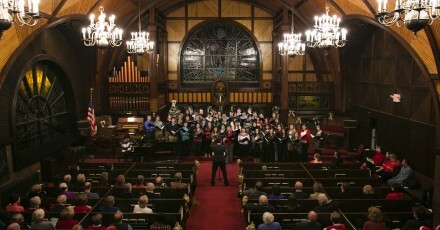 The annual Goddard Chapel holiday concert on December 4, 2013. What's a humanist-in-residence? Charlotte Gilliland '16 interviews Walker Bristol '14 about his new role on campus!